1. What is this event all about ? The Republic Ride is a novel cycling event to celebrate the spirit of our Republic – India. This event series started in the year 2010 and has grown significantly year on year. The Republic Ride holds the distinction of being the best and the biggest century (100KM) ride in India.Through this event, the cycling community comes together to promote sustainable transportation, health & wellness, and an eco-friendly life style in India. 2019 edition is the 10th annual Republic Ride and will witness 3000+ riders completing a century (as an individual or as a team) with zeal and enthusiasm. 2. Who is organizing this event ? The lead organizer for the Republic Ride is CYKUL, the No. 1 Cycling company in India, and is actively supported by government agencies such as Cyberabad Police, GHMC, TSIIC, ITE&C Dept, Sports Authority of Telangana and the Industry Forums such as SCSC, HYSEA, NASSCOM, TIE, and CII. The registration fee for each participant is Rs. 1500. (Excluding taxes). 4. When is the last day for registration ? The last date for registration is 15th January, 2019. However, the slots tend to fill up quite early so please register as soon as possible to avoid disappointment. 5. What is the venue ? The start and finish points of this ride will be at the Gachibowli stadium. 6. What are the important details of this event ? a. 19th January: i. Joy Ride: A fun ride for family, friends, colleagues to enjoy safe cycling, great food, & lively entertainment. Distance options start from as small as 2KMs. Interesting special formats are available for kids (bicycles and Cycles with supporter wheels), couples (tandems- cycles). 7. Will breakfast and lunch be provided on event day ? Yes. The participants can access all the food and beverage facilities such as breakfast on route, snacks and drinks at support stations, and lunch at stadium. There is no additional charge for any of this food/beverage arrangement. 8. What is the maximum time taken to complete the ride ? The allocated time to finish the ride is 8 hours i.e. from 6:30AM to 2:30PM. Based on the historic data, almost all of the riders and teams will be able to finish their ride in the stipulated time. However, for some reason, if you are unable to finish the ride post 2:30PM, our Last Support Vehicle will pick up you and your cycle and drop you at the finish point (Gachibowli stadium). 9. Do you provide medical support during the ride ? How do I request for it ? The ride flag off time for both Signature and Relay Ride is 6:30 AM. 12. Do we get any hard copy of the route ? Yes, the hardcopy of the route map will be provided to you along with the rider kit. 13. Is the registration fee same for all riders regardless of age group ? 14. What if, we don’t have our own cycle or helmets ? 15. What do participants receive after completion of the ride ? Participants will get a medal and an e-Certificate. E-certificate link will be provided to you through e-mail or SMS. You can also download your certificate from Cykul Pelotons App. 16. What do I get in a rider kit ? 17. Who can participate in this event ? Any individual who is physically fit can register for the event. 18. Are there any transportation facilities to reach the venue on event day ? There are no transportation facilities organized by the event team. The riders will have to reach the venue on their own. 19. Do I need to get anything from home on the event day ? • While food and beverages are provided along the route, at the support stations, it may be prudent for you to bring the bottles/sippers to carry water/drinks while on the route. • Please note that the you are required to attach head and tail lights to their cycles. Further, the riders may bring additional items such as pocket tools; puncture kit, etc in order to deal with any unanticipated breakdowns during the ride. • You are requested to bring the copy of registration confirmation. • Please carry your ID proofs and your mobile phone and cash along with you in case of emergencies. • At your own discretion, you can bring appropriate personal items such as wallet, camera, etc. ; however, you are fully responsible for your personal belongings including the cycle. • Please note that, there are no locker facilities available either at the start point or the endpoint. 20. What is a smart card ? How to use it? What if, I lose my smart card ? 21. What is Relay Ride ? As you know, “relay” has been the most popular segment at the Republic Ride over the many past years. Every edition is over-hauled, based on the previous user feedback – and we try to evolve and enhance the user experience as we progress. This time too, we have introduced some new additions to our relay format, so we encourage you to read this short note and be familiar with the format and the changes. What’s New in Relay format? This App is the single most important tool in your kit, be it for real time help during the ride, time-stamps, mechanical & medical support, access to food and beverages, navigation/route map, live-tracking, e-certificate etc. As a Republic Rider, you have been given free access to this App for the whole month of January. Please use this app to record your ride, and there-by capture the times for individual and team effort and also to secure the ranking on the leaderboard. 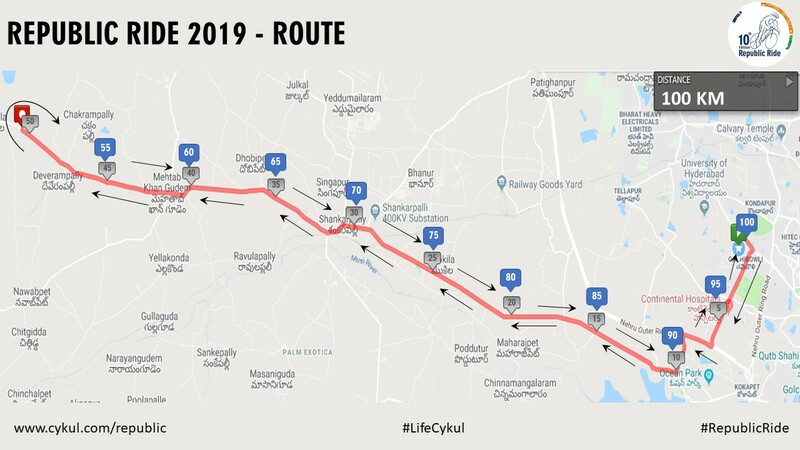 5 KMs of right most lane will be blocked for the Republic Riders. Enjoy dance/music/entertainment at the stadium whether you are waiting for your relay turn or have finished the turn. Gachibowli Stadium is the switch over point for all relay formats. Breakfast / Brunch will be provided at the Stadium. Avail multiple food options using LifeCykul App. The Relay Segment will have additional water points (every 2-3KMs.) to help with the hydration requirement of riders. Work-hard & play hard. Keep your energetic participation going beyond the pedaling -- take part in the celebrations enlivened with energetic dance & music around the main stage area. Relay Riders’ registration includes a fulsome snack-box. Additional Food-Stalls will be available for those who would like to purchase supplementary food. 22. I misplaced my rider kit. Do I get one more rider kit ? Or what do I do now ? If you misplace the rider kit, please note that only the smart card can be replaced, that too for a fee of Rs.50/-. Further, please note that some of the services (e.g. E-certificate) may take a bit longer time than usual as they are driven off the smart card unique number. 23. Is there any training sessions before the event day ? Yes, you can visit Gachibowli stadium on weekends or Palapitta Cycling Park on daily basis to practice for this upcoming event. 24. Can I park my cycle at the venue ahead of the event ? The riders can park and lock their cycles at the venue ahead of the event on their own risk. The organizing team does not hold any responsibility in case of any damages or theft. 25. Are there any parking facilities for the riders at starting point of the event ? Yes. Please follow the parking instructions and security directions to avoid hassles. 26. Are there any Sweep trucks available ? Yes. There is one sweep truck as LRV (Last Rider Vehicle). In case of breakdown, please request for a mechanic support through Cykul Pelotons App. 27. Is there any drop home facility available if I am unable to ride ? No. There is no drop home facility. The rider can wait for the sweep truck to get back to the venue. 28. Do we get any mechanical support while riding ? Yes. Rider can request for the mechanic support through Cykul Pelotons App. Mechanic will reach your location within 10 minutes. 29. Where are the support stations set up ? There are support stations every 10 kilometers on the route. 30. Do we have any cut off timing for the ride ? If so, what is the cut off timing ? Yes. 2:30 PM is the cut off time for finishing the ride. However please note that the intermittent support stations also have specific cut off times, so please refer to your rider kit material or the Cykul Peloton App to know the exact cut off time for all the services within the ride. 31. Do we have any rest rooms on route and venue ? Yes. We do have rest rooms at the stadium, and mobile toilets on route. 32. Is there any emergency contact number ? In case of emergencies/assistance, please call: +91 888 602 9585. Please note that you can reach respective support station supervisors through the Cykul Peloton App also. 33. What is the Event Flow on 20th ? • 6:00am - Reporting time. • 6:15am - warm up. • 6:27am - flag hoisting, national anthem. • 6:30am sharp - the flag off. • Breakfast will be provided on route for the riders. • Lunch will be provided at the stadium. • Riders will be facilitated with medals back at the stadium, followed by lunch. 34. Can I get one more lunch or breakfast kit ? No. Only one breakfast and one lunch kit will be provided per rider. 35. I have not registered my name before; can I register on the day of event ? There are no spot registrations on the event day. 36. I had registered my name before. But, my name is not there in the list. What do I do ? Please call on: +91 888 602 9585 or visit help desk at the venue with the registration confirmation receipt. All the riders are requested to get the registration confirmation print- out sent by TAF at the time of the registration. Without the registration confirmation copy, rider kit will not be provided. 37. Where can I collect the cycle on the ride day ? Please note that this applies to the relay riders only. All the cycles are parked at the Cykul Stations in the stadium. Please go to your respective organization stall, scan your smart card to pick your cycle.